Enterprise Architect has a full and rigorous implementation of Use Cases and Scenarios including being able to create Use Case Diagrams that include Scenarios. The Use Cases and Scenarios can be included on a number of other diagrams to show how business processes are automated or which component realizes the Use Case. There is also an innovative editor where the detailed steps of Use Cases and Scenarios can be created and these can be generated to documentation thus completely dispensing with the need to create Word Processor files to document Use Cases. The steps can also be automatically generated to a number of diagram types including Activity and Sequence diagrams. The generated diagrams can be synchronized with the steps if they change and the diagrams redrawn. The Scenario Builder is a productive and unique tool and editor that allows the analyst to work with the text of Use Cases and Scenarios directly inside the model. Many analysts will be familiar with creating long and voluminous Word Processor documents describing the details of Use Cases. With the Scenario Builder the descriptions and steps of Scenarios can be entered directly into the repository and linked to other elements. Alternate and Exception paths can be defined including branch and re-entry points. Diagrams representing the steps in a scenario can be generated and automatically synchronized. Constraints including Preconditions and Post-conditions can be defined and Test Cases automatically generated. Elements that have a relationship to the selected Use Case are listed in a convenient Context Reference list. The Use Case Diagram is a simple and powerful way of describing the goals the users of a system (or entity) want to achieve. It describes who wants to achieve a particular goal but not how the goal will be delivered. 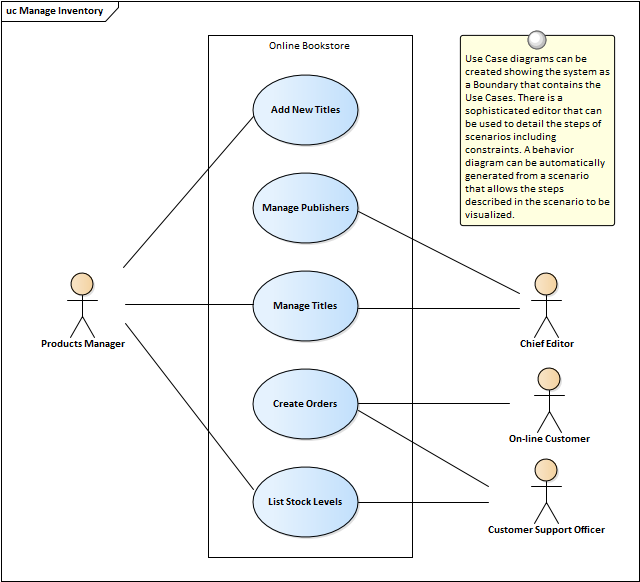 Use Case diagrams can be simple or structured and relationships such as Include, Extend and Generalization can be added to refine the model. A system (or entity) boundary can be added with a descriptive name showing clearly that Use Cases reside inside the system and Actors outside. The Relationship Matrix can be used to define and display the relationships that exist between Use Cases and other model elements including up-process and down-process elements. The up-process elements could include Business Processes, Stakeholder, Functional or Non-Functional Requirements, Business Use Cases and more. The down-process elements could include Components, Building Blocks, Test Cases and Experience models and more. The Traceability Window automatically displays the relationships that exist between Use Cases and other model elements including up-process and down-process elements. The traceability tree view can be conveniently expanded to see deeper relationships and elements displayed in the window can be located in all diagrams in which they appear. The Specification Manager can be used as an alternate tool for working with Actors and Use Cases. The names, descriptions and properties of the Actors, Use Cases and Scenarios can be conveniently created, viewed and edited in a list resembling a Word Processor or Spreadsheet presentation. Even though the Scenario Builder provides a productive way of defining Use Cases and Scenarios, there will be situations where formal documentation is required describing the Use Case. The Document Generator can be used to create high quality corporate documentation using a built-in Use Case Report template, or an analyst can define their own custom template. An HTML report can also be created, allowing click-through and drill-down.